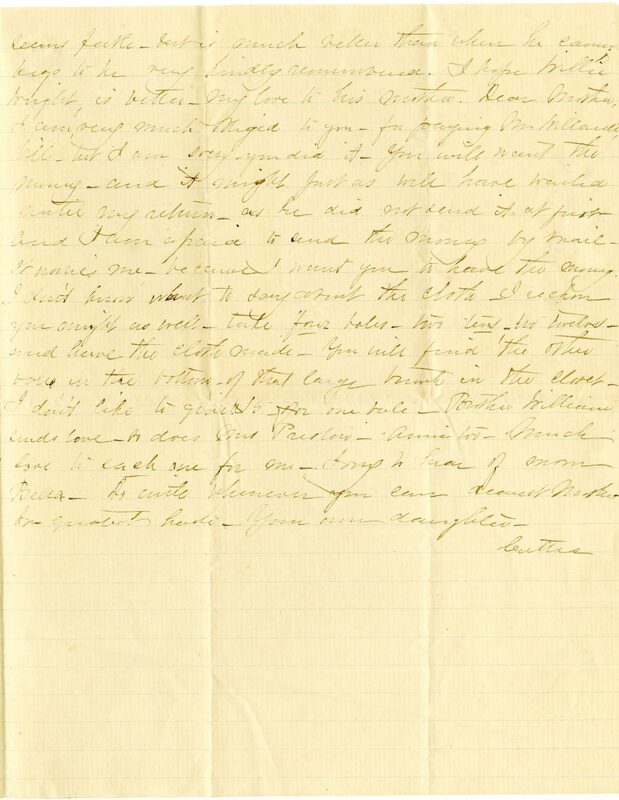 Item description: Letter, dated 6 August 1863, from Catherine (Cattie) Kennedy in South Carolina to her stepmother Catherine DeRosset Kennedy. Cattie discusses her brothers’ sickness and various treatments, as well as household expenses. 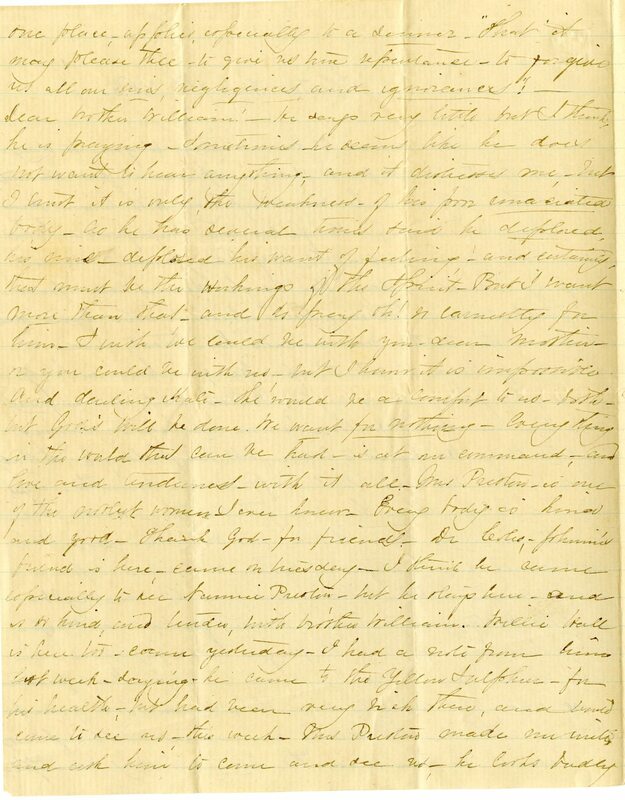 Item citation: From Folder 58 of the DeRosset Family Papers, #214, Southern Historical Collection, Wilson Library, University of North Carolina at Chapel Hill. Dear brother William! He [?] very little [?] I think he is [praysing?] – I [?] – he seems like he does not want to hear anything, and it [?] me, but I [hurt?] it is rily the weakness of his poor emaciated body – as he has several times said he deplored his mind – deplored his want of feeling – and certainly that must be the workings of the Spirit. But I want more than that – and do pray oh! so earnestly for him. I wish we could be with you dear Mother, or you could be with us, but I know it is impossible. And darling Kate – she would be a comfort to us both – but God’s will be done. We want for nothing – everything in the world that can be had – is at our command, and love and kindness, with it all. Mrs. Preston is one of the [?] women I ever knew. Every body is kind and good – Thank God – for friends. Dr. [Cotes? ], Johnnie’s friend is here, came on Tuesday. I think he came especially to see Nannie Preston – but he [?] here, and is so kind, and tender, with brother William. [Billie?] Hall is here too, came yesterday. I had a note from him last week, [saying?] he came to the Yellow Sulphur for his health, but had been very sick there,and [would?] come to see us this week. 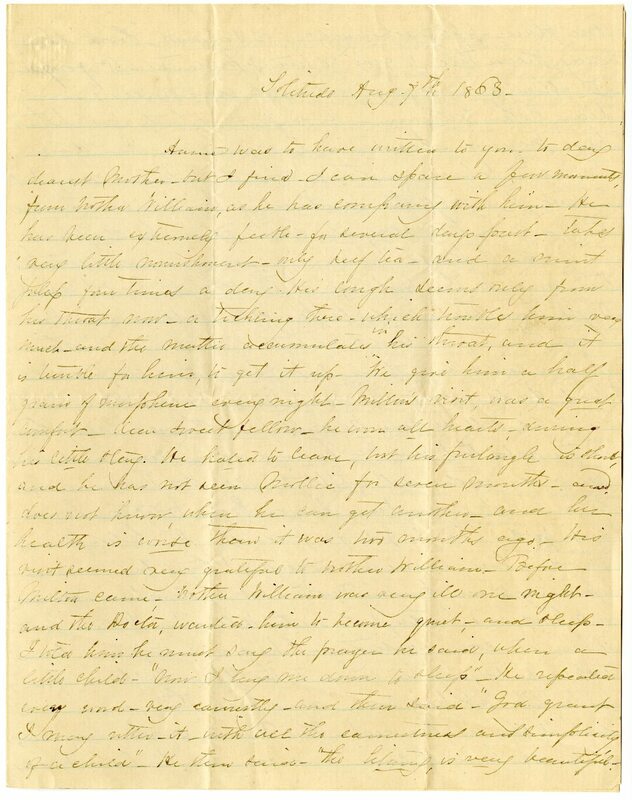 Mrs. Preston made me write and ask him to come and see us – he looks badly seems feeble, but is much better than when he came, begs to be very kindly remembered. I hope Willie’s [?] is better. My love to his mother. Dear Mother, I am very much [?] to you for paying Mr. Willard’s bill, but I am sorry you did it. You will want tho many and it might just as well have waited until my return, as he did not send it at [just?] and I am afraid to send the money by mail. It worries me because I want you to have the money. I don’t know what to say about the cloth – I reckon you might as well take four bales – two tens [two?] twelve and have the cloth made. You will find the other bales in the bottom of that large trunk in the closet. I don’t like to [?] for one bale. Brother William sends love, so does Mrs. Preston. Annie too. Much love to each one for me – [?] hear of [mom?] Bella. Do write whenever you can Dearest Mother.